Caps nation seemingly let out a collective sigh of relief last Sunday morning when goaltender Braden Holtby took to the ice for practice at MedStar Capitals Iceplex. 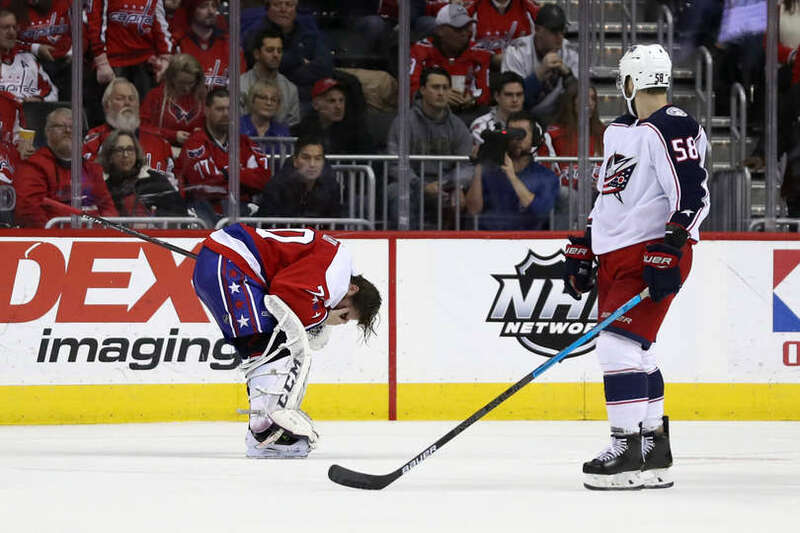 Holtby left in the second period of the Washington Capitals’ 2-1 overtime loss to the Columbus Blue Jackets the previous night with an eye injury, and his status was unknown. His readiness for Sunday practice made it seem that the proverbial bullet had been dodged. After practice on Sunday, Holtby met with the media, and all seemed to be progressing well with the Vezina Trophy and Stanley Cup winner. The team decided to start Pheonix Copley Monday against the Blues, and have Holtby start the second game of the back-to-back set in Nashville on Tuesday night, giving Holtby an extra day to recuperate. But that wouldn’t be the case. Holtby’s Status was downgraded just a few hours before the start of their game against the Predators. As a result, the Capitals would need to go back to Pheonix Copley for a second-straight night, and had no time to make a call-up. In other words, Copley was the only goalie option for the Capitals Tuesday night in Nashville. Reirden said Caps didn’t know that Holtby would be unavailable until just a few hours before the game. Didn’t have time to recall someone, and Copley was going to stay in the whole way no matter how bad the score got. Reirden’s comments after Tuesday night’s game in Nashville made it sound as though he fully expected Holtby to start against the Predators. And if there was any doubt, the team would have made a call-up. That didn’t happen. As a result, the game was Pheonix Copley’s, from start to finish, no matter what. And if Copley sustained an injury, or couldn’t finish, Holtby would have had to play at less than 100 percent. Not an ideal situation, to say the least. The Capitals have an off-day on Wednesday and will return to practice on Thursday to begin preparations for Barry Trotz and the Islanders on Friday. If Holtby is still not 100 percent at practice on Thursday, look for the Capitals to call-up Vitek Vanecek from Hershey. The Bears are in Binghamton tonight and will be in Wilkes-Barre/Scranton on Saturday. The Capitals organization is currently a little thin at the goaltender position, as both Parker Milner and Adam Morrison at ECHL affiliate South Carolina have been dealing with injuries as of late. This would limit the call-up candidates for Hershey, should Vanecek or Samsonov be required in Washington. This entry was posted in News and tagged Braden Holtby, Nashville Predators, Pheonix Copley, Vitek Vanecek. Bookmark the permalink. This seems like poor planning and management by the Caps. Something doesn’t seem right. Hence a young goalie gets shelled for seven goals.